> Missed Part 1? Read it! After a second fruitless day of tiger spotting in Ranthambore National Park, India, Todd and I are sharing a drink with the Patels, a Gujarati family on their Diwali vacation. It’s dark but still early – the town adjacent to Ranthambore, called Sawai Madhopur, is a small place with little to offer beyond hanging out at your hotel once the safari winds down. 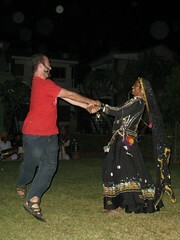 We met the Patels last night at a special Rajasthani dinner and traditional dance performance at our hotel. The Patels cheered on as Todd and I each took a turn dancing with the performers, and were surprised that we had a few Indian-style moves. Tonight, over big bottles of Kingfisher beer and spicy vegetable pakora, we tell Hardik and his wife Suhani how we got our first introduction to Indian dancing in the streets of Chennai at our friends Raja and Sarah‘s wedding, four years ago on our first trip to India. Hearing of quick affinity for the food, people, pace, movies, and even the train rides, Hardik declares “You are both probably Indian in a past life!” Though we don’t believe in reincarnation, this conclusion still somehow makes perfect sense to me and Todd. Later, after hours of conversation about culture and politics, work and play, love and marriage, and Gujarat and California, Hardik tells us,”I have no problem understanding your English. Usually with Americans the words all run together.” Abashed, Todd and I admit that we speak differently in India, with a clipped, broken cadence to make ourselves understood. We know that our California drag with its note of New Yawkah is hard hearing for non-native English speakers. As the night grows late and the mosquitoes bold, we’ve spent many hours talking with Hardik and Suhani. There’s an easy familiarity. They remind Todd and I of the friends we’ve had since high school – curious, caring, genuine, and proudly a little nerdy. And generous – hearing that we’re heading in the same direction tomorrow, Hardik and Suhani invite me and Todd to ride to Jaipur with their family, which also includes Hardik’s parents, Mr. and Mrs. Patel, and young sons, Sparsh and Helish. It’s an offer we can’t refuse. Not only do we get to skip a long bus and longer train ride, but we get to spend more time with the Patels. 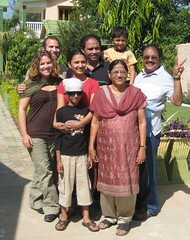 How often does a traveler get to not only meet locals, but also spend time with them and their family on a road trip? We love road trips. It’s a cozy ride – including the driver there are seven adults and two kids in the minivan. Suhani, Sparsh, and I sprawl in the hatchback, lounging on a thin mattress laid over our suitcases while Todd sits in the seat ahead with Hardik. We chat constantly over the next several hours, showing each other photos of our homes and families, and looking at Todd’s art. Helish, the older son, treats Todd and I to magic tricks, jokes, and brain teasers, with his father Hardik as his helpful assistant. In return, Todd and I try to tell a few knock-knock jokes, only to realize that knock-knocks are not universal. As soon as we try to explain why a knock-knock joke is funny, it loses its humor in translation. We stop for a late lunch in a random town. There we learn that Gujaratis don’t save dessert for last; instead, they take tastes of sweet gulab jamun in between bites of savory thali. Though we’re nowhere on the tourist radar, it’s one of the best thalis Todd and I have had in Rajasthan, which may have as much to do with company as the food. Even while eating, Todd – of course – starts to draw, encouraging Sparsh and Helish to draw too. Soon, all our attention is on the three artists, who shoot furtive glances across the table while sketching each other’s portraits. 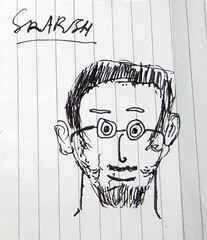 At the end, it’s a draw – Todd trades his portait of Sparsh and Helish for the ones that each of the boys made of him. Happy ’09 & cheers to many more exotic adventures! I’m so sorry to hear about your Aunt Jul, Lauren. Peace and hugs to you and your family.